Walter our ever faithful stonemason who is constructing the dry stonework track and staircase in the Pharos Gully is looking to start working his magic again this year. 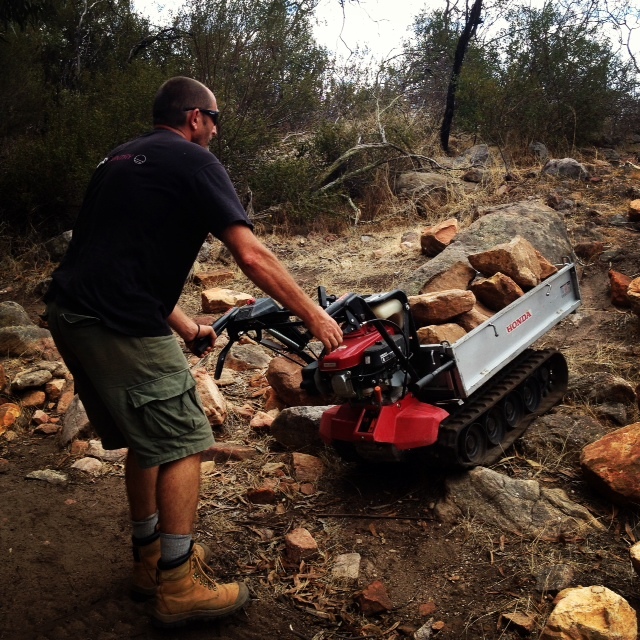 We moved a good few rocks or more last weekend with the power carrier as far as we could but we now need some more people to jump on the stretchers and move some rocks up to where Walter is working. The usual deal. Pick up a rock, put it in the stretcher and join your fellow stretcher members in a little light hauling. Half an hour or so is all that’s expected of each person. More people = spread the load. And to celebrate the first one of the year, there will be a bbq for all volunteers. CliffCare will be running the fundraising bar at the festival over the 4 evenings and 1 matinee session. Those who went to the Radical Reels festival late last year will remember us serving your drinks and being run off our feet This time we have more sessions so we need more volunteers. It’s a pretty good deal actually. You help us by serving a few drinks before the show and then at the 20 minute intermission. In turn for doing this, you get to see the movies, have refreshments and if you don’t already have an RSA(responsible service of alcohol) certificate then we will pay the certificate fees. You just need to do a short 3 hour course. Great to have, and needed if you want to work in bars, restaurants etc. And it will cost you nothing! It’s great fun – we all had a ball doing it last year. Dates are: Wed 19, Thurs 20, Fri 21 & Sat 22 June. On the 22nd there is also a matinee screening starting at 3:30pm. If you can help but are only available for the starting session or intermission, please let me know. The sooner you can let me know if you are available the easier it will be for me to roster efficiently. This entry was posted in Arapiles, events and tagged arapiles, fundraising, volunteers erosion by Tracey. Bookmark the permalink.